It takes quite a lot to drag me away from my nails' best friend, CND Stickey. I've been attached to this base coat for so long that it feels like I'm cheating to try a different one. But try a different one I did ... and I fell in love instantly. 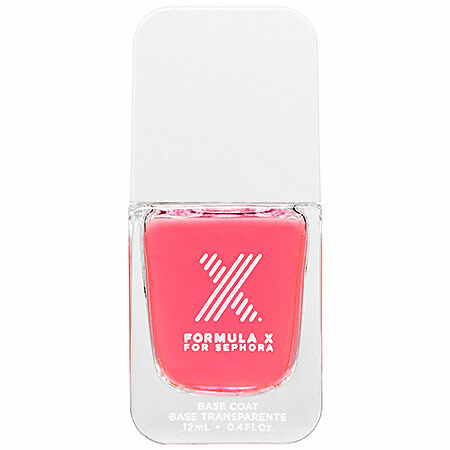 Enter Formula X For Sephora Base Coat. All I'm really looking for in a base coat is one that adheres to the nails and dries quickly without feeling sticky, keeps polish from staining and helps cut down chipping. Well, this base coat delivers in spades! It's formulated with an advanced adhesive primer and bonding agents to protect your nails and help nail polish last longer. Plus, it doesn't smell too strong or concentrated. So if you want to say goodbye to orange or yellow nails and hello to polish that lasts and lasts, this is the base coat for you! Formula X For Sephora Base Coat retails for $10.50 at sephora.com. I seriously might need to get some!